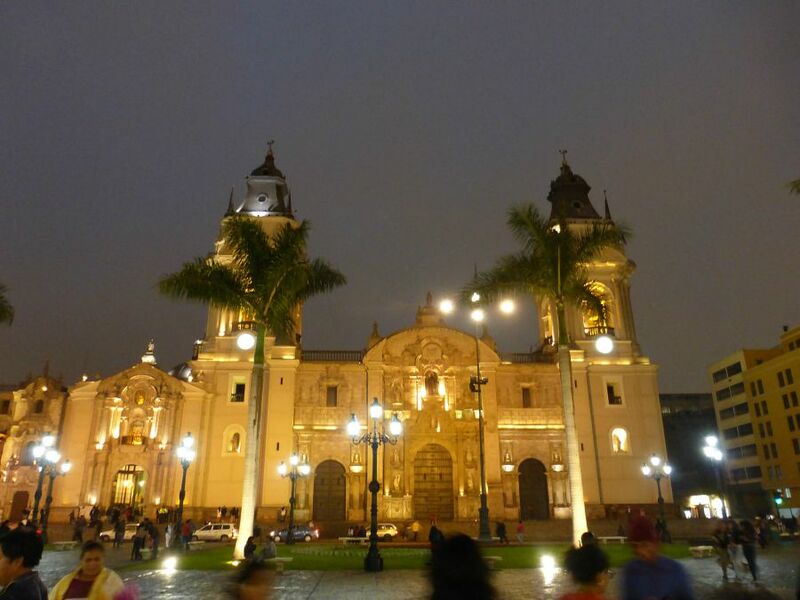 Just like many cities, there are several versions of Lima that you can experience. 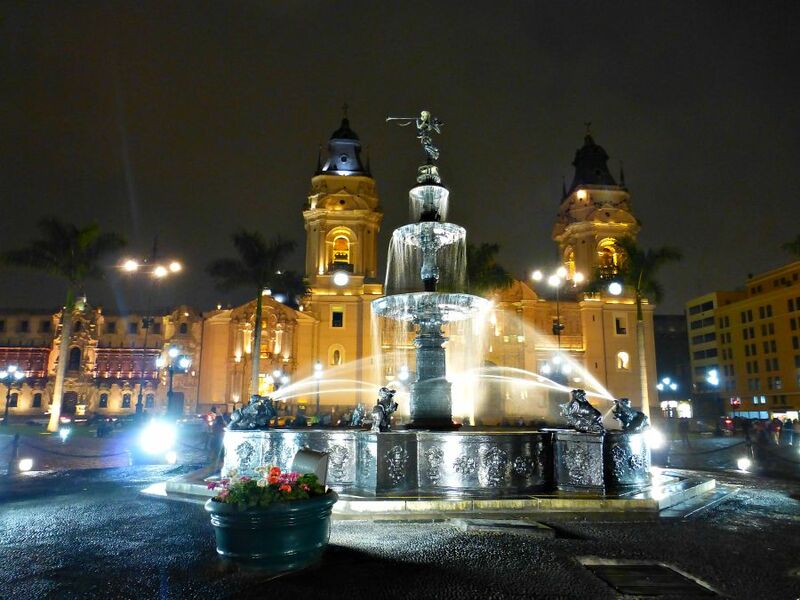 There is Lima during the day, with all of its historic sites, shops and restaurants. And then there is Lima at night, when the music gets a little louder, crowds of locals get a little thicker and the smell of street food starts to permeate the air. It all gets tossed together with lots of local libation and the stage is set for a good time. You could easily travel to Lima and miss out on the local hot spots where Peruvians party, but not today, we’re here to tell you exactly where to go to join in the fun. We had already joined Lima Urban Adventures on a tour of the downtown and a bike ride around the coast. So, the decision to also take a “Night Bites and Sights” tour with them, guided by a local who knows exactly where to go, was a no-brainer for us. Make sure to keep your bike safe. The fact that they took us to several cool bars and brought us to the best street vendors in the area along with tucking our soggy selves safely back into a taxi after negotiating a fair deal for us, proved it to be a very good choice indeed. We started out in the Plaza Mayor in downtown Lima. By day the busy plaza is a place where people gather to hear political speeches or to just meet and relax with friends. By night, the fountain in the center of the square is a popular place to get a picture, for good reason. 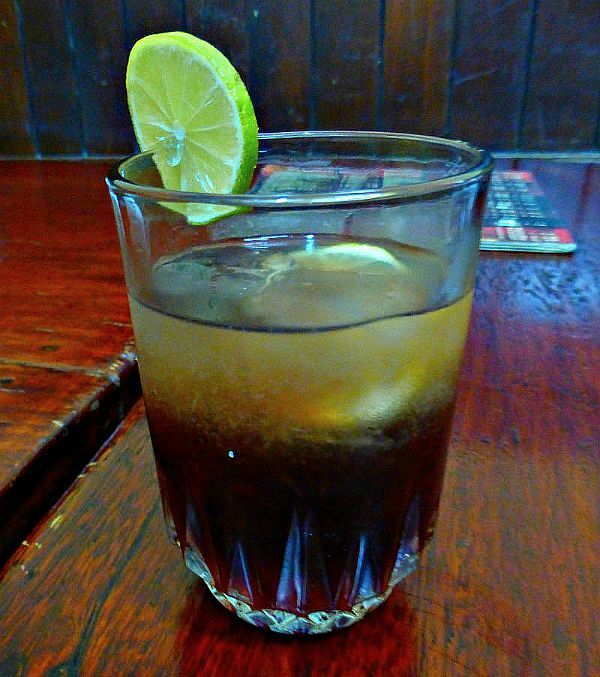 After taking in the sights of the square, we wandered to the Bar Cordano, one of the oldest bars in Lima. 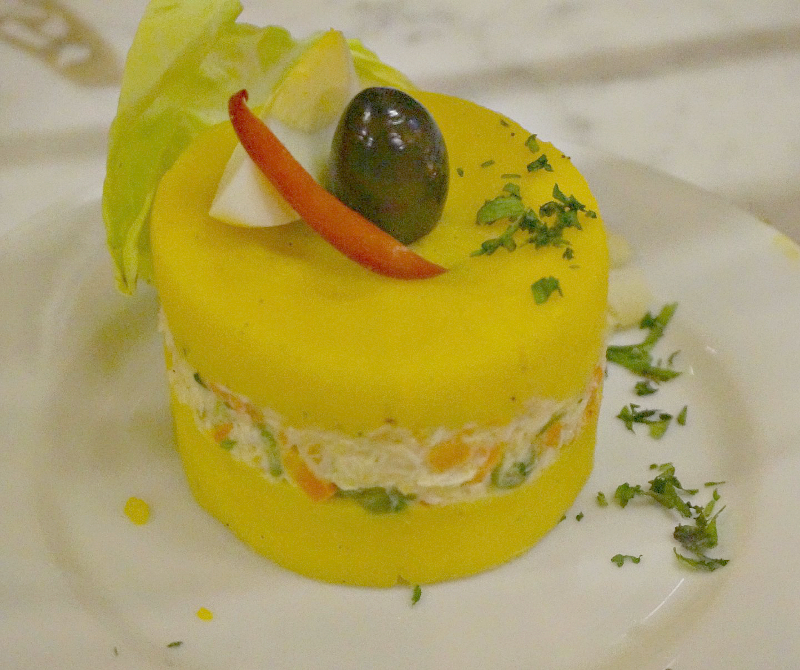 The place is filled with locals eating classic Peruvian fare (such as this cold layered potato salad called Causa) washed down with the national drink, the Pisco Sour. We received a demonstration of how this interesting cocktail is made – which involved mixing the ingredients together in a cocktail shaker with egg whites, resulting in a frothy drink that tastes a bit like a margarita. Next we were off to the outdoor food vendor area. Before we reached the plaza we could hear musicians playing and start to smell the smoke of food cooking on the grill. As we reached the plaza we started to see the red and white carts that encircle the plaza, each serving up a different local favorite food. And we tried quite a few, starting with what was for me a more adventurous but very popular plate. 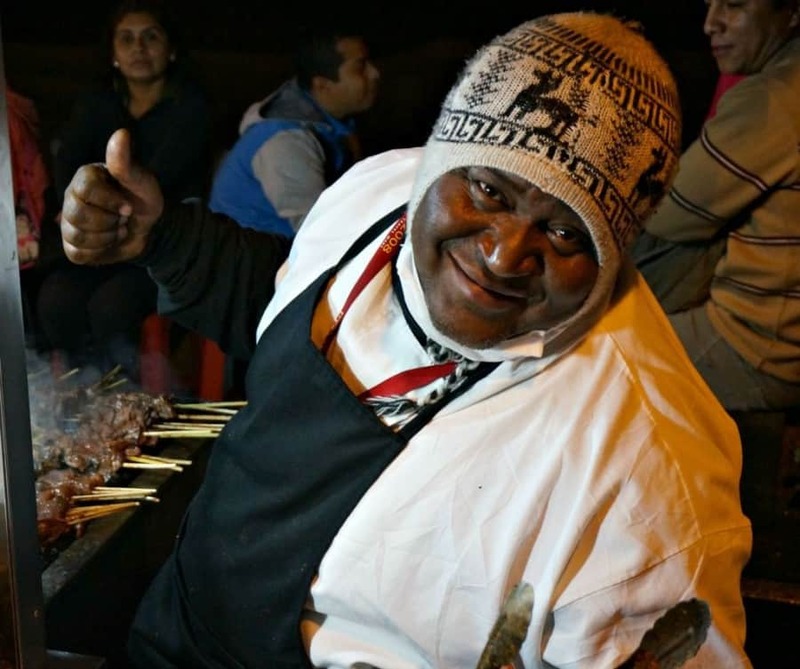 This bite was anticuchos – marinated and grilled beef heart skewers, served with a healthy portion of grilled tripe and the staple over-sized corn (choclo) that you find accompanying most dishes in Lima. The beef heart was actually very flavorful and delicious. I can say the tripe wasn’t my favorite but there were plenty of other people in line who would disagree with me. 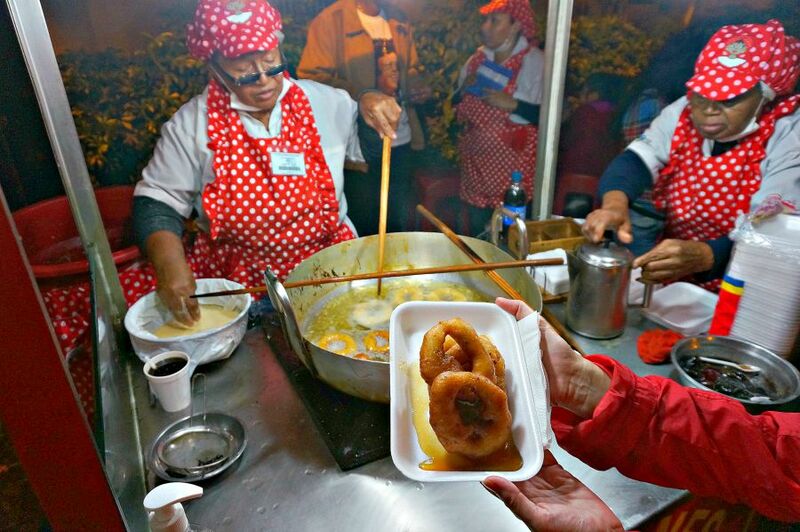 Next we tried the picarones, a fried dough served with a fig syrup – much like a donut. The woman making them chatted away with us (despite our broken Spanish) and told us about her twelve children and growing army of grandchildren. No wonder working the dough into small round that she expertly plopped into the hot oil, just a few inches away, didn’t phase her. 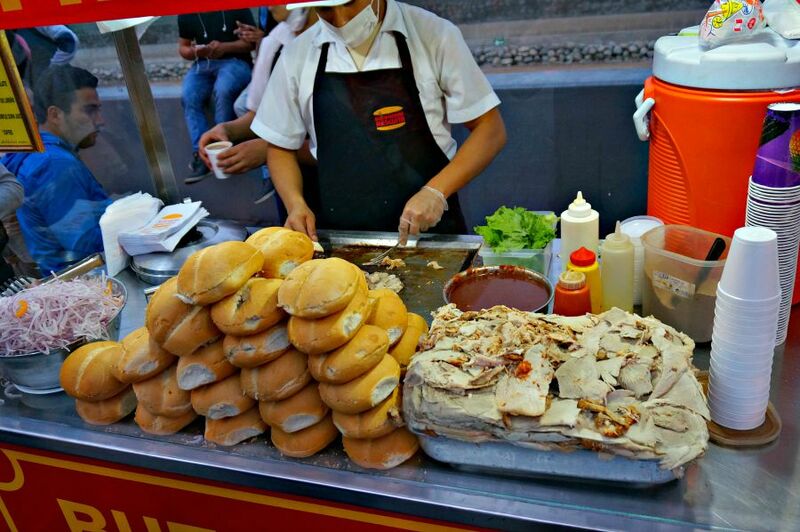 We then tried what was our favorite – a grilled pork sandwich called a butifarra. This sandwich was topped with fresh onions, a slightly spicy sauce that was warmed on the grill with the lean pork slices. It’s then topped with a mayonnaise based sauce before being deposited on a fluffy bun that perfectly soaks up the sauce but stays lightly crunchy on the outside. This could now be my husband’s favorite sandwich, ever. 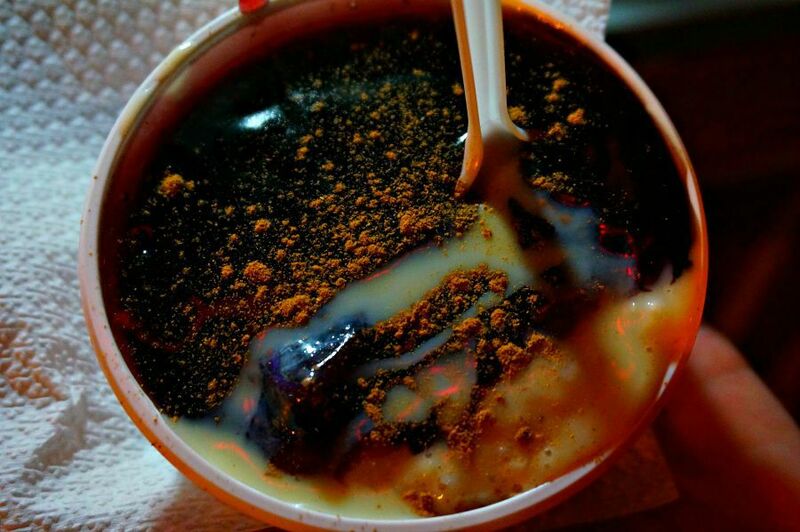 Lastly we tried another local favorite dessert combination mazamorra morada and arroz con leche. It tasted like a warm rice pudding paired with a sauce that tasted similar to blueberries (or maybe that was just the color). Although in this dish the deep purple color of this dessert is supplied by purple Peruvian corn. It was nice, sweet warm comfort food. 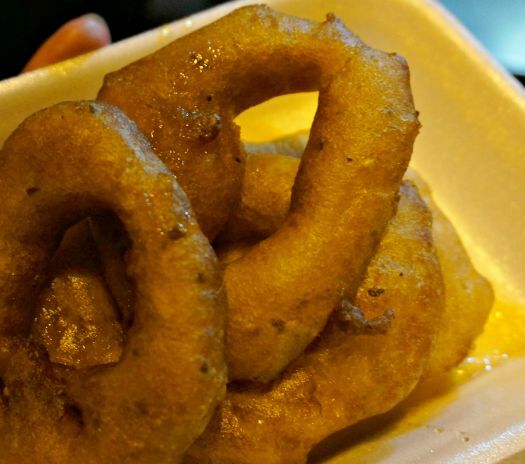 There were very few English speakers or tourists to be found among the food courts, but despite that we were warmly welcomed at each stall as the owner made and served the food that they love. Once we were well fed, it was time to continue hunting down the local watering holes. 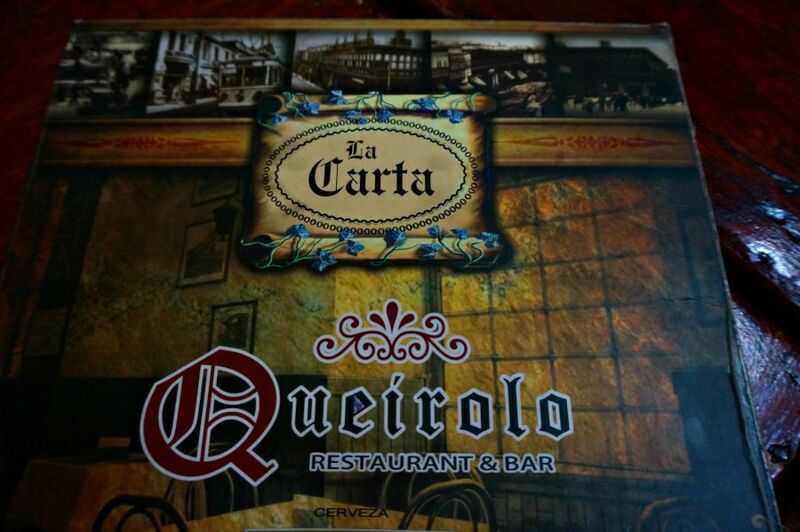 We were shown into Queirolo, which was full of locals laughing together in tables, many topped with a bottle of Pisco and a liter of ginger ale. Pisco is a brandy made from distilled grapes, often with an alcohol concentration 38-48 percent. Potent stuff. 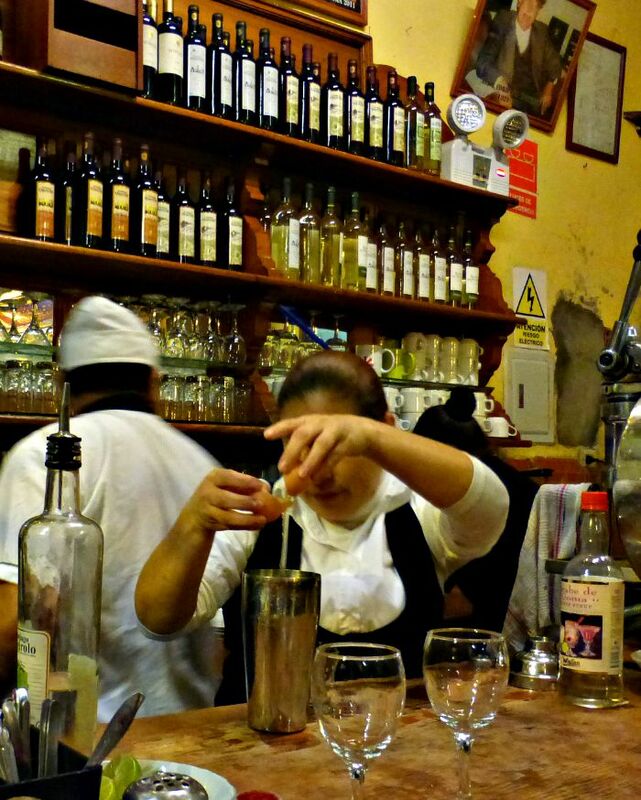 Queirolo has been serving locals in Lima for over 100 years, and actually makes some of their own Pisco in house. 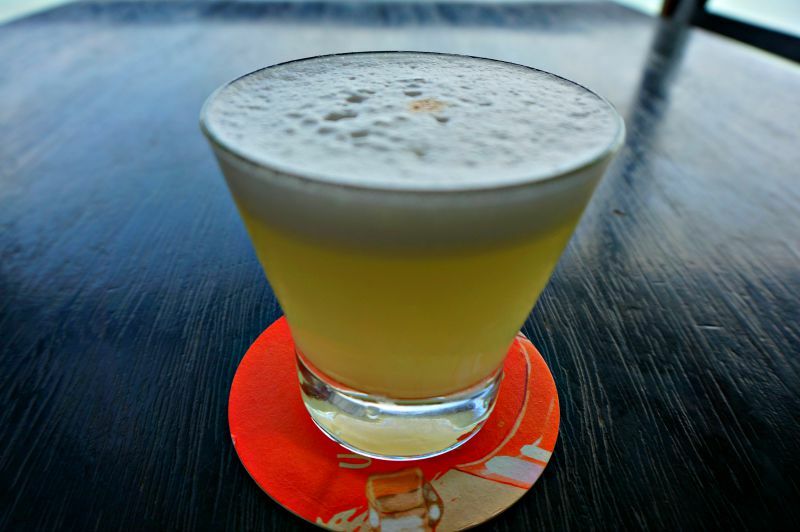 Since we had already tried the Pisco Sour, we were given another version of the drink, this time with an infused Pisco without the frothy egg white topping. I’d say it was a little bit of a milder flavor but equally as good as the sour version. We finished off the night by traveling to another local favorite bar, the Munich La Huaca – which was essentially a beer garden. 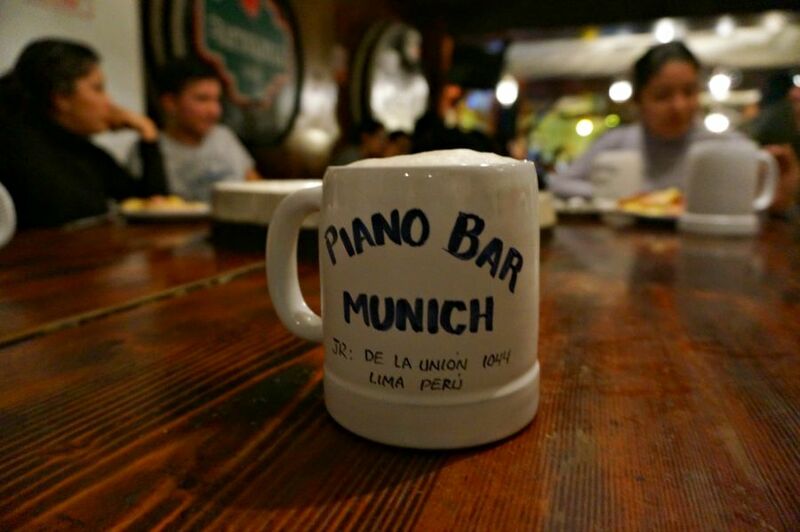 I know, it doesn’t sound particularly Peruvian, but that doesn’t stop the locals from coming here and enjoying the beer and piano music. There were several small groups in the bar centered around very large tables. The idea here is to find yourself a seat and join the party. Why not? We chatted it up with the other people in the bar, including one college student who took the chance to practice his English on us, while his girlfriend worked on a heaping dish of salchipapas. We had seen this dish in other places in South America – a guilty pleasure of french fries and hot dog slices (or several types of sausage in this case) served with various dipping sauces on the side. We were too stuffed to order a platter this night, but isn’t it fun to end an evening having found something that has enticed you back for more? And actually, that sums up the night – perfectly. Thank you to Lima Urban Adventures for guiding us to all of these fantastic places and helping us have a very memorable time in Lima. As always, our opinions are our own. I hope your showing your sister around to all the great food stalls. I imagaine my brotherinlaw in in seventh heavan with all the good food. Peru is one of my dream destinations and I’d love to thoroughly explore the bustling big city of Lima! Have a pisco in Miraflores, walk down to the beach… take my time to explore thoroughly before visiting Machu Picchu. Ah, fond memories! 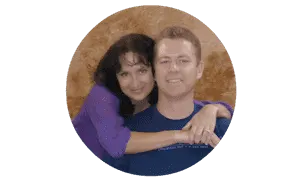 We were in Peru, the first country in South Am, in March. Man they do like a party. We crashed a Sunday session in a ‘bar local’ near our homestay in Cusco. The clientele had most definitely not showered! Great post and thanks for the reminder of good times. 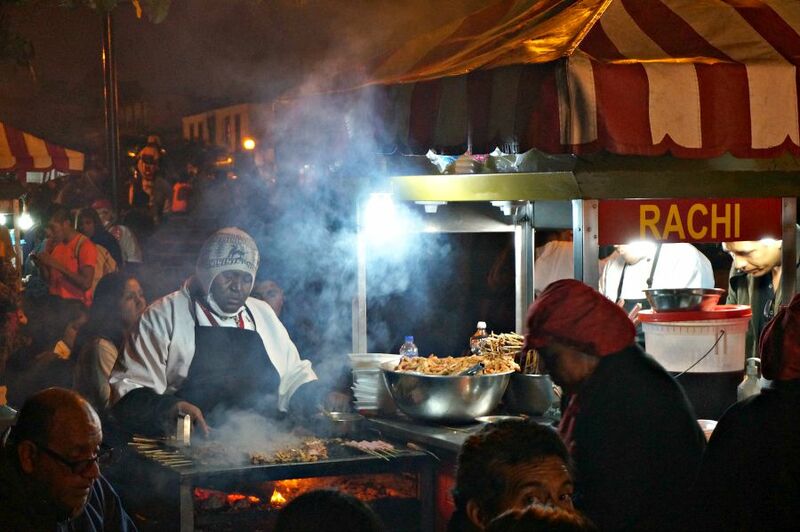 Love the night visit and foodie tour, this is definitely something I would love to do if I visit Lima. Guy on pic looks so happy 🙂 Like the food, makes me hungry now! I love visiting outdoor food markets and seeing where the locals hang out. This sounds like a really great tour! I still dream of the food in Peru. 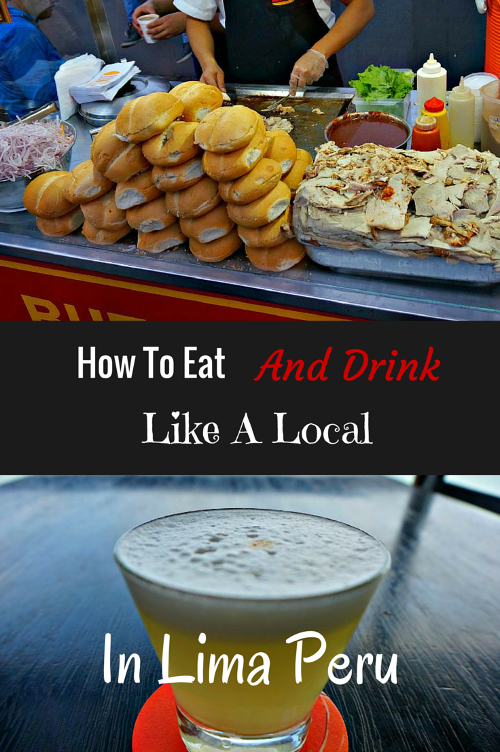 I LOVED leche de tigre and ate it every day while I was there. I didn’t get to try a butifarra. It looks really good. I have to yet to explore Peru, but the thought of all of that incredible street food just adds to the reasons I should go! Doing anything as a local would is a great way to experience a place as it should be experienced. Looks like you had a lot of fun and that outdoor food market looks incredibly delicious! I have heard so much about Peru lately that i might have to take a South America Trip before SE Asia! it is so hard to decide where to go! there are so many places to see!